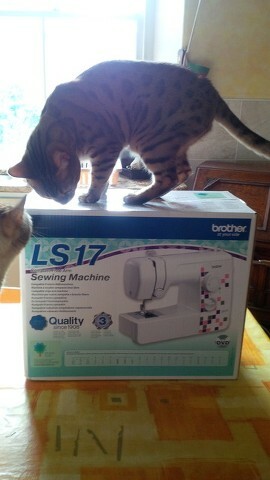 Welcome to the sewing family, Brother! Having used the trusty ol’ hand-me-down Singer sewing machine for the past year and a half that the OH was given more than 5 years ago, I’d recently taken the plunge and bought a brand, spankin’ new sewing machine. I saw a deal come up on Groupon and after much hemming and hawing, decided to go for it. The deal had come up previously, but I was quite content with the trusty Singer we’ve been using for many years. The temptation of not having to sew button holes by hand and being able to sew more than just a straight stitch was too big to resist any longer. Especially when the OH’s mum gave me some money to buy a new one. The impatient wait has finally come to an end, the box was sitting waiting patiently for me when I came through the front door after work!